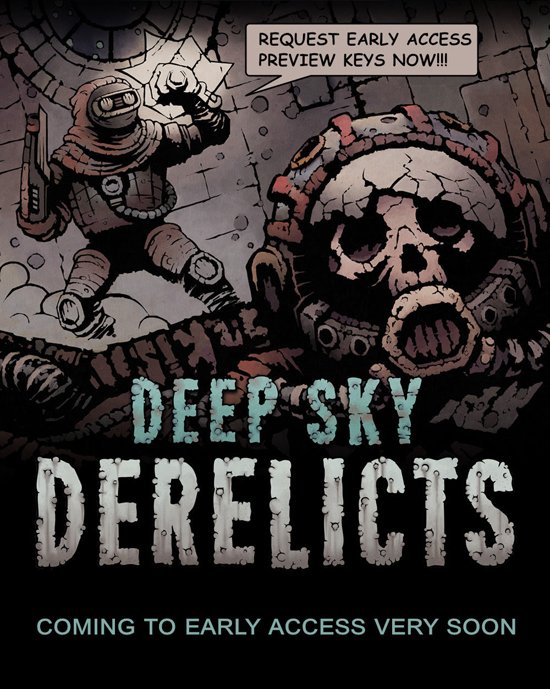 Deep Sky Derelicts (http://store.steampowered.com/app/698640/Deep_Sky_Derelicts/) is almost here. Start your voyage through the dark and dangerous space of Deep Sky Derelicts where you will fight, talk, hack, persuade or deceive your way towards a cozy life on a hospitable planet. You will encounter alien races, weird creatures, as well as humans - friendly or not so much… It is up to you how you will approach them. Although Deep Sky Derelicts is now being released in Early Access, there already is a lot of content within the game to make your experience an enjoyable one. The Story Mode, though capped at character level 3 out of 10 and unfinished yet, offers several hours of exciting gameplay with quite high replay value, thanks to already existing content variety and procedural generation of levels and gear. Namely, there are 6 character classes to build your squad from, 13 equipment core types and 17 extension types, which make for countless variations of actual weapons and tools to equip, over 70 different playable cards those pieces of gear may contain, and 12 missions to spice things up and give you a snippet of the final game story to taste. And if that’s not enough, there’s always the Arena Mode which will provide a great way to test tactical thinking, various weapons and attacks, as well as luck during this battle-survival mode.